The 2016-17 academic year has been filled with many exciting events to report for our OMT program. The classes of 2016 and 2017 earned a 100% first-attempt pass rate on the COMT multiple-choice examination administered by IJCAHPO. We also continue to have a 100% employment rate among graduates electing to enter the workforce upon program completion. Employer’s that rate of our graduates 6 to 9 months after program completion continue to report very high satisfaction of graduate preparedness. Suzanne Hansen said farewell to the role of OMT Program Director and Chair of the Department of Ophthalmic Technologies. Hansen and her family relocated to Frisco, Texas, due to her husband’s employment in December 2016. Mrs. Hansen remains a valued faculty member and advisor to the department. Her contributions to the program over the last 15 years have helped shape its superb reputation locally, regionally, and nationally. Alicia Baird, CO, COMT, has been named the 4th Program Director and Chair of the UAMS Department of Ophthalmic Technologies in the OMT program’s history following Suzanne Hansen, MEd, COMT; Aaron Shukla, PhD, COMT; and Christopher Westfall, MD. 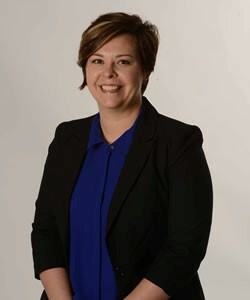 Baird began her new role in February and comes to UAMS from the University Hospitals and Rainbow Babies Children’s Hospital in Cleveland, OH, where she spent five years as a Certified Orthoptist, Certified Ophthalmic Medical Technologist and Clinical Research Coordinator for the Pediatric Ophthalmology and Adult Strabismus Department. Mrs. Baird is a graduate of the UAMS Ophthalmic Technology program, earning her Bachelor of Science degree in 2010. She also completed an Orthoptic fellowship at the Orthoptic Teaching Program of Tulsa in Oklahoma in 2011. She maintains certifications by the American Orthoptic Council as a Certified Orthoptist and by the International Joint Commission on Allied Health Personnel in Ophthalmology as a Certified Ophthalmic Medical Technologist. Mrs. Baird is a member of the Association of Technical Personnel in Ophthalmology, the American Association of Certified Orthoptists, the International Orthoptic Association, and the American Association of Pediatric Ophthalmology and Strabismus. Our program is also excited about a newly renovated space that will be ready soon! The program moved to a temporary location for the last year awaiting the newly renovated space that will include updated OMT classrooms, student study area, offices, and future OMT students will also have access to the ophthalmology simulation center.